Robert McCaw has investigated actual mysteries of the Island about the Axe makers and delivered an excellent murder mystery involving characters he brought to life. He has juxtaposed this, a cultural legacy of mystery with modern character motivation in a contemporary setting utilizing the development of intertwining plots, subplots, red herrings and all. Having lived on the Big Island of Hawaii since 1990, we feel that this author has captured the spirit of the Big Island with the science, technology, cultural history, current cultural values and practices. This is an excellent murder mystery and an outstanding achievement for a first time author. Now, the real mystery is when will the next novel with Koa Kane be released. being reflected in the book. Definitely recommend to everyone. Can hardly wait for the next Koa Kane book. Hope your not busy tomorrow because this book is an all niter,(or two). Very much enjoyed the characters, locations, and their descriptions, the author takes you there. As for the case, a rollercoaster of who did it. I wasn’t ready for it to end, looking forward to going along on Koa’s next case. Beautiful Hawaii holds many ancient secrets & now a ritualistic murder of a young, brilliant astronomer. A new smart & human detective enters our realm & captures our imagination…Koa Kane. He is a native Hawaiian who has clawed his way up the bureaucratic ladder through ferocity, doggedness & intelligence. We are swept away in Koa’s discoveries & clues. Every page holds another piece to the puzzle until the end when we are once again involved in a twist of fate to uncover Keneke’s killer. I, for one, was wrapped up in the ancient rites & modern day technology of the observatories. Well done, Mr. McCaw…cannot wait until another case needs to be solved by this illustrious detective. Thoroughly enjoyed this book. Full of interesting characters and absorbing plot twists. The author takes you on a ride deep into Hawaiian culture as his star character, Koa Kane, solves a really nasty crime. Loved the intrigue that built throughout and the sense of Hawaii this book gave me. https://www.amazon.com/gp/customer-reviews/RKTFMOKWRXYS9/ref=cm_cr_pr_rvw_ttl?ie=UTF8&ASIN=B018J24DO4A wonderful first novel for Robert McCaw. He keeps the reader riveted to the book as the characters and story are developed. With the overlay of Hawaiian history and culture, McCaw creates an intricate story of intertwining events, themes and personalities. Carefully building to its climax, the book leaves the reader satisfied with Detective Kane’s resolution of this complicated and difficult investigation. With Koa Kane, and the Hawaii setting, McCaw has created a new and exciting platform for the mystery novel reader. This reviewer is looking forward to McCaw’s second installment of his Koa Kane Hawaiian Mystery series. McCaw’s debut novel is excellent. Koa Kane is a terrific new character, a real “good guy” without being at all self-righteous. The novel is well-paced and builds to an exciting climax. McCaw’s love and respect for Hawaii and its history and culture are evident throughout. His military and legal background lend credibility to the characters and plot developments. I also found the science fascinating. Looking forward to Koa Kane’s next adventure. I love a good mystery, especially one made rich with the history and culture of an exotic place. Along with the elements that make a mystery so much fun…. the turning of a detective’s mind, the sifting through of evidence, the cast of suspects, this book is like traveling through the many microclimates of Hawaii. It’s an adventure of sight and sound, as well as the many voices that tell the tale of our 50th state. I hope there’s more to come as Koa finds himself embroiled in another crime on the Big Island. A compelling murder mystery with a unique protagonist and a spectacular setting. It paints a fascinating portrait of Hawaii in all its complexity, from folklore to culture to the military to its special role in astronomy. The story delivers a fast read, cool twists and turns, and a satisfying conclusion. Well worth a read, you’ll enjoy it. A great read. For me the best part of the story is how the author intertwines Hawaiian history and technology. As Koa follows the trail of the crime we are shown the current dynamics of the island life. Artifact thieves, political ambition, and political pressure are all too evident. The author’s intimate knowledge of the Big Island lends much credibility to the story. I am looking forward to the next episode. WOW!! If you like a fast pace, quick turns, well-developed characters and “edge of your seat” excitement, you will love this book. Mr. Mccaw’s love for Hawaii is obvious from the wealth of accurate detail both current and historical to be found in this book. Detective Kane is faced with unraveling a murder mystery bizarre enough to daunt any law enforcement officer, even a seasoned one and only someone well versed in ancient Hawaiian lore could succeed. Mr. Mccaw’s skill with a pen makes the twists and turns of plot believable to the point of causing the reader to sweat right along with Detective Kane as he hits one baffling roadblock after another. If you are looking for something fresh, exciting, and unusual you will love this one! It is apparently a first book which is surprising given its depth. I hope he has more to come. I was so excited to see a new author in the crime thriller genre break through some of the “same old same old” authors. 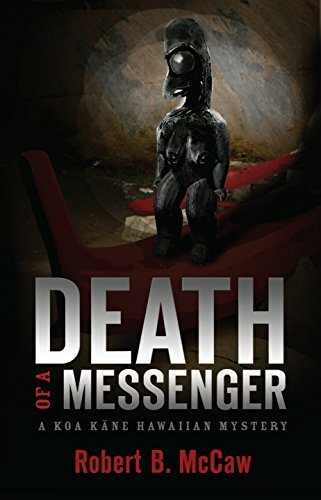 Robert McCaw has introduced a rich new setting and cast of characters in his new book Death of Messenger and I loved this book. I am afraid of giving away too many of the plot twists but be assured this is a great read and you won’t want to put it down. The characters are engaging and although I have been to Hawaii (once) I realized there is a lot more to Hawaii than I thought. I have a whole new appreciation for the culture. I can’t wait for the next book in the series! It is difficult to believe that this is the first novel by this author. It is a “hang onto your hat” paced story with enough well-developed twists and turns to keep you thinking you have figured something out only to find you haven’t, and off you go down another path. Mr. Mccaw’s skill with a pen creates a very believable cast of characters and his love for Hawaii is clear in his meticulous attention to Island detail. Within a very few pages you are sweating gently along with Detective Kane as he deals with the bizarre details of a truly hair-raising murder mystery. If you are tired of the “same old same old” run of mystery novels this is a must read. Fresh, exciting, unusual, and historically accurate it is truly a great find. Would love to see this one made into a movie! Hopefully Mr. Mccaw has others on the burner. The islands of Hawaii provide the setting for an outstanding police procedural. Modern science weaves against native tradition to produce a case where sorting out the bad guys and assigning proper responsibility is a most difficult task. Everyone seems to be guilty of something, but who is guilty of what, and why are they guilty becomes a puzzling case for Kao Kane, the super detective from Hawaii. Everything falls into place by the end, but it is quite an ending. Well worth a read. Hawaiian detective Koa Kane responds to a violent crime scene at Pohakuloa, an army training site. A body has been found inside a cave, so savagely mutilated as to be unrecognizable. The only things that seems clear is that the murder has all the markings of a ritual killing. Also uncovered at the crime scene are ancient burial crypts and a stonecutter’s workshop sealed off for 500 years. Is the victim a grave robber, or someone who came upon others looting the site. Too make matters more complicated, another man is injured at an illegal dig on another island. When the victim’s i.d. is finally confirmed, there are suspects coming out of the woodwork. Can Koa narrow down the list before another person is killed? I really enjoyed this mystery that took me into the heart of Hawaii, into the rituals and the past; the things that tourists never see. I can’t wait to read McCaw’s next installment.